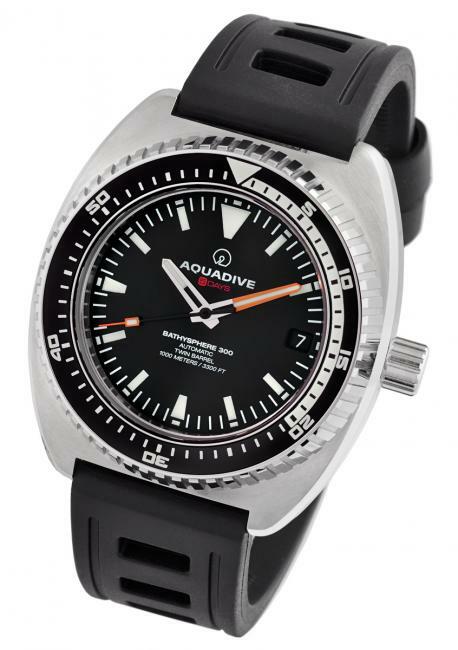 Aquadive was a household name and sought after brand among professional divers of the 60s and 70s. Due to their sturdy design and reliability, the Aquadive watches were considered a must have equipment among the professional divers of the time. The company did not survived the quartz revolution, but after 10 years of planning and acquiring old stock of movements, cases and other components, in 2011 the Aquadive name was brought back to life in Pforzheim, Germany. A new line-up of watches was introduced, paying tribute to the legendary AQUADIVE watches of the 1960s and 70s and even in some cases using NOS components of the original line-up. The watches are assembled in Switzerland from German and Swiss materials. The new Aquadive Bathysphere 300 Model 51 is a high end modern update of the classic Time-Depth Model 50, produced with the exact same case as the original and powered by a highly refined all Swiss manufactured and assembled automatic movement. 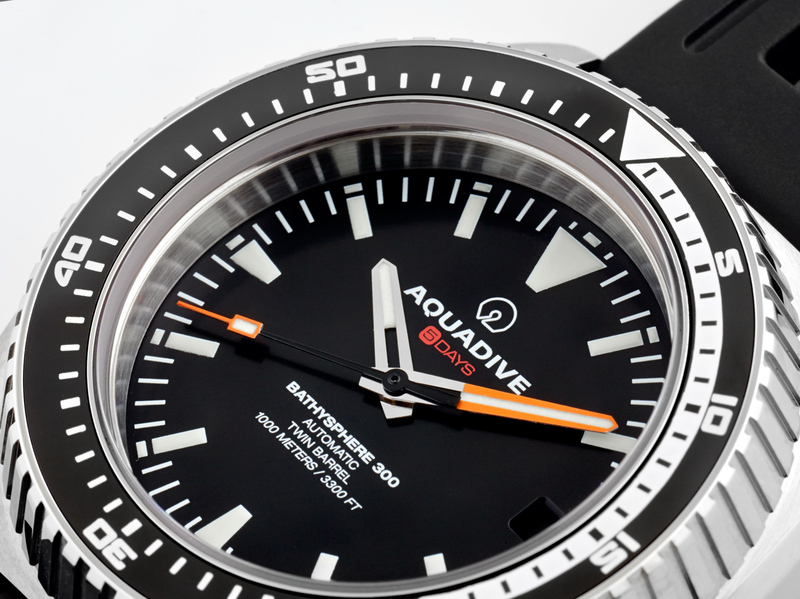 The original Aquadive Model 50 debuted in 1973 with a design so revolutionary it was patented (US Patent No.337 78 60). A professional dive watch from lens to caseback, the Model 50 incorporated the industry’s first mechanical depth gauge. The new technology required a 47mm case to accommodate the oil filled bronze depth gauge and the electronic quartz movement. No less than astronaut/aquanaut Scott Carpenter approved and endorsed the watch in early advertising programs. The big, bold Model 50 became an instant “must have” amongst the diving elite at a time when modern advanced dive computers were still decades away. “This limited production model was developed for collectors, purists and aficionados who love the style of the original iconic 1972 watch and desire a showpiece movement to accompany their investment,” says Aquadive General Manager. The Haute Horology Model 51 utilizes the same case as the original. It is CNC machined in Germany out of a 60mm solid steel disc cut from a 316L surgical grade 3m rod. Each Case is then polished and brushed by hand in Germany. 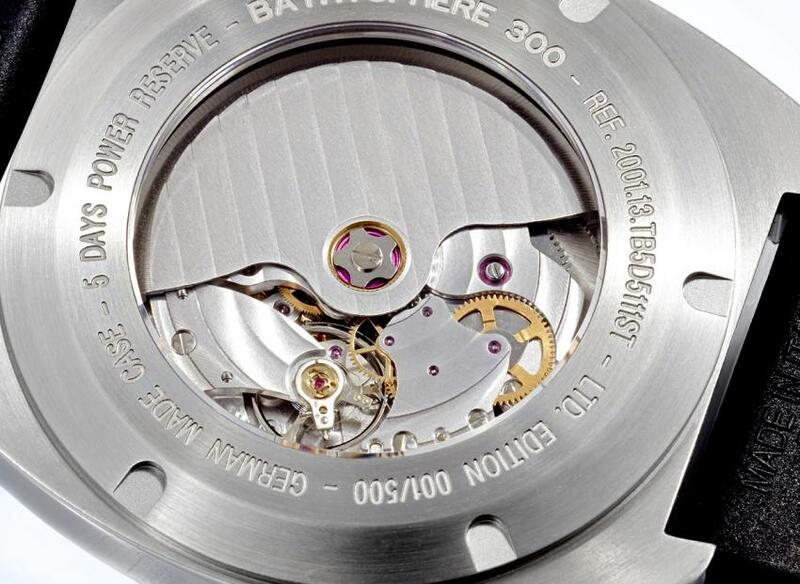 The remaining components including the dial, hands and crystal are all made in Switzerland. Inside the Model 51, you’ll have a 13.25 line Swiss manufactured movement with a 5 day power reserve and twin barrel construction. It is a 35 jewel movement functioning at 28800 Bph, something you usually get in watches retailing at well over $5000. The original Model 50 is now a highly regarded collector’s item. Some models were made for the U.S. Navy SEALS and command nearly $3000 on the collector’s market. The new Aquadive Classic Reissue line will make watches like the Model 50 available, with highly updated and desirable movements typically found in famous high end luxury watch brands. The new line represents a hybrid marriage of classic style and modern movements, in short, a new collectible. 45mm stainless steel uni-directional rotating bezel, 120 clicks, laser-cut ratcheting spring, scratch-free Ceramic insert, engraved with elapsed time markings. 33mm Sapphire crystal. genuine ISOfrane 24mm strap with solid stainless steel signed (AQUADIVE) buckle. Coming in January 2012, an Optional Aquadive stainless steel bracelet based on a vintage Aquadive design, with automatic ratcheting dive suit extension; or an available stainless steel Mesh bracelet. Bracelet availability, cost, and photos to come. .
Scratch-resistant, anti-reflective 5mm flat sapphire crystal with anti-glare coating.